So at the end of March my friend Molly had me and Donny over to make a whole bunch of pickles. 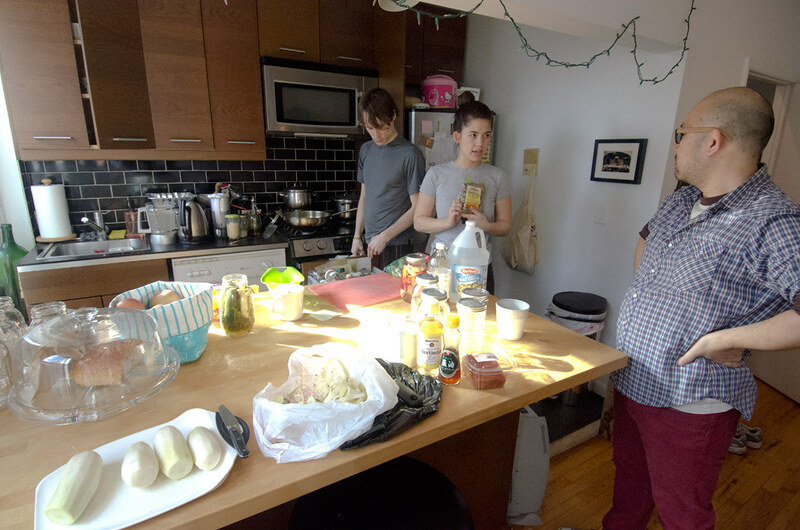 We made the obligatory jokes about how “Brooklyn” it was to be making our own pickles, and of course that Portlandia skit came up, but it was still a lot of fun. 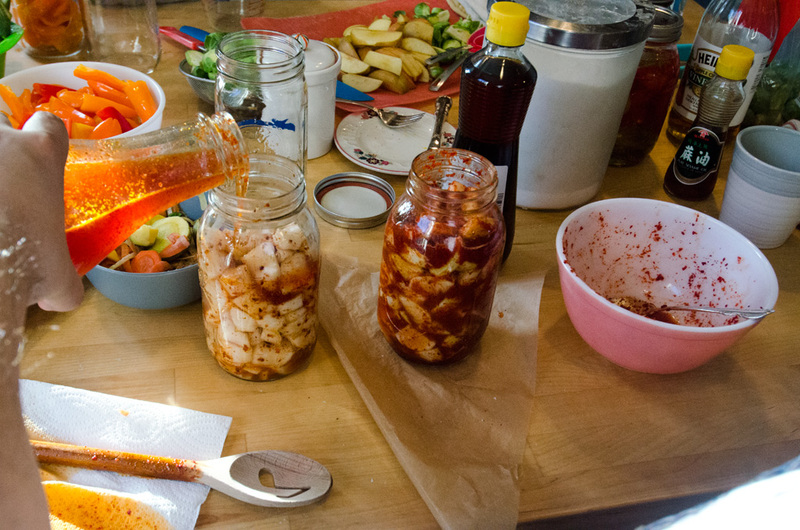 Most of our pickles were for a party that Molly was having, but I did make a large jar of Korean style pickled radishes, which came out smashingly. A semi-recipe and more photos after the jump. I started with four medium-sized tae baek radishes, though daikon would work too. Rinse them, peel them, and cut them into roughly half-inch chunks. Place the chunks into a strainer and heavily salt them with kosher salt. Then set the strainer over a bowl and let them sit for about half an hour. The salt is going to draw moisture out of the radishes as well as season them. 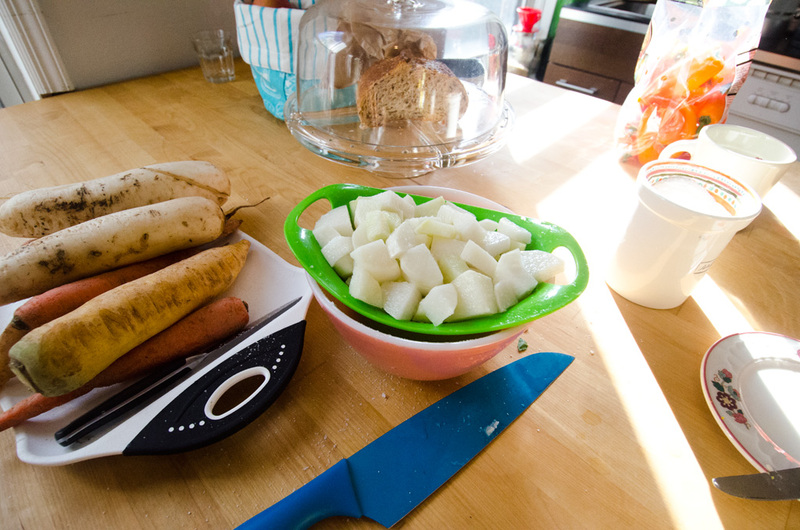 While the radishes drain, prepare the pickling solution. This is a cold pickle, no heating required. 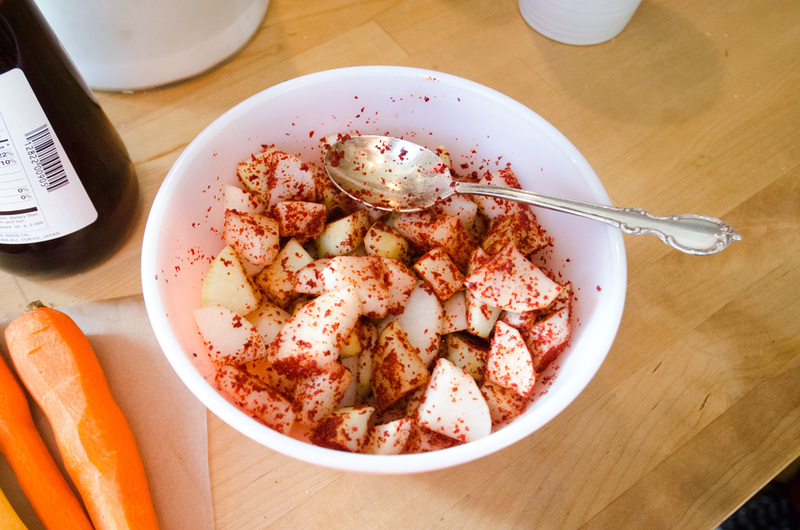 In a large jug combine a bottle of rice wine vinegar, a cup or so of distilled vinegar, a tablespoon of salt, a tablespoon of sugar, a sprinkle of sesame oil, and a few heaping tablespoons of Korean red chili flakes. I found the last at one of my local Korean-owned grocers, but I’m sure you can find a supplier online somewhere. Then add a little water and stir it all up until combined. Once half an hour has passed rinse the radish chunks very well to get rid of all of the salt on the surface. Sprinkle them with some more of the chili flakes. Place the into a sanitized jar and then pour the vinegar mixture over them until covered. Let the liquid settle for a minute, and after it bubbles down to fill in all of the crevices you’ll have to add some more. Put on the lid, tighten it as much as possible, and shake it to make sure it’s all evenly distributed. Put it in the refrigerator for at least a week. 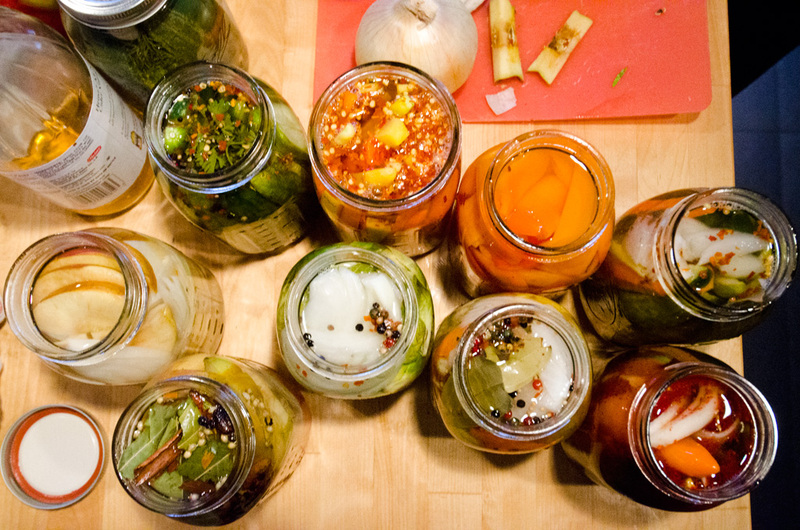 So yes, it’s a totally Brooklyn hipster move to make your own pickles, but who cares? The radishes come out crisp, salty, sour, sweet, and sharp; slightly smoky from the sesame oil and slightly spicy from the chili flakes. Plus a pickle party gives you an excuse to hang out with your friends and come up with interesting combinations of items to pickle and seasonings with which to pickle them. Pickle parties may not be replacing birthday parties or key parties any time soon, but they’re pretty fun in their own right. This entry was posted in cooking and tagged cooking, pickles. Bookmark the permalink.